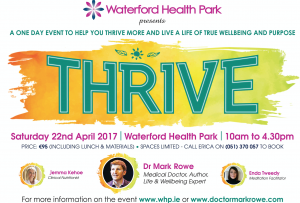 We are delighted to be running a one day ‘Thrive’ Event on Saturday April 22nd at the Waterford Health Park presented by Dr. Mark Rowe. This will provide a tremendous opportunity to explore some game changing ideas about your wellbeing with like minded people in a fun filled environment. Modern life is full of distraction in this era of obsessive hyper connectivity. Negative stress and needless negativity abound. In fact we are hardwired for it. Only one in five people is thriving and living life fully at their best. More people than ever are searching for a sense of real purpose and meaning. ‘Thrive’ gives you the chance to slow down, press the pause button and be more present, with a heightened sense of awareness and clarity. – Psychological Fitness: How you can develop and strengthen your mindset and sense of mindfulness. – The Power of Habits and Willpower and How to Harness their Potential. – Emotional Vitality: How you can develop and enhance your inner happiness and sense of fulfilment. – Purpose and Meaning: How to create more of a sense of fulfilment and connect to your purpose in life. – Relationships : How they impact on your wellbeing. ‘Thrives’ goal : to energise and empower you to take the next steps forward on your wellbeing journey. Lunch,course materials and the workshop itself are all included for the price of just €95. The workshop will run from 10am-4.30pm at the Waterford Health Park. Free Parking on site. Any questions please drop an e-mail at info@doctormarkrowe.com or call 051 370057 and ask for Erica. This event will sell out fast. We’re only releasing a limited number of tickets so please book early to avoid disappointment!